For more than 40 years, big business and the Republican party have teamed up to drive down the wages of construction workers by attacking their unions, passing so-called “right-to-work laws”, and weakening or repealing prevailing wage laws— which protect construction wages from downward pressure. They have, unfortunately, been very successful. Construction wages are lower today than they were in 1970, despite 40 years of economic growth and a higher national income. The real average hourly earnings of production/nonsupervisory construction workers were $26.17 in 1970, $26.00 in 1980, and $23.91 in 1990. 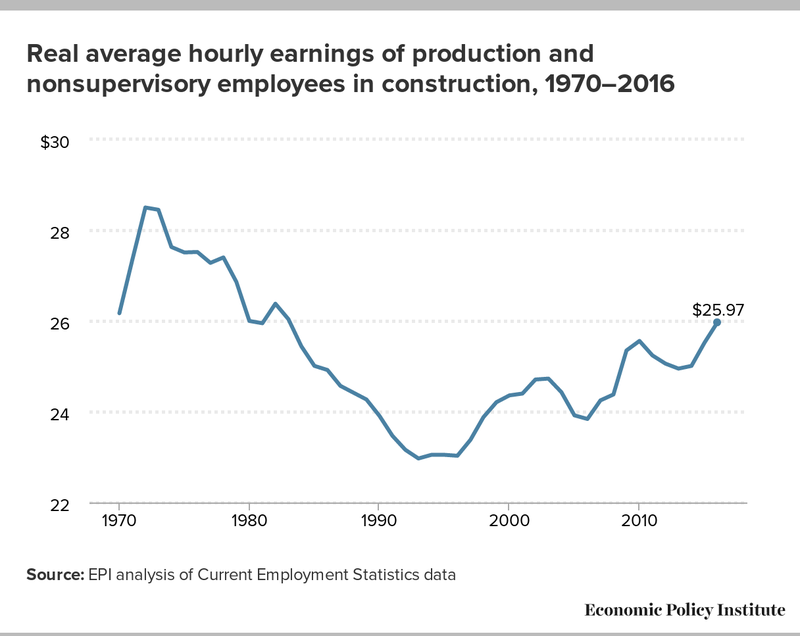 Construction workers’ hourly earnings bottomed out at $22.97 in 1993 but have never fully recovered from their 1970 peak and were only $25.97 in 2016. State law changes pushed by business groups and enacted by Republican-dominated legislatures have been a major factor in the decline of construction wages. Since 1979, prevailing wage laws have been a particular target. Without prevailing wage laws—which require contractors to bid and pay at least the average wage in their locality when working on public construction contracts— contractors can cut wages to win bids, rather than competing on the basis of efficiency and management skills, material costs, or the productivity of their workforce. Though they have protected construction workers’ wages for decades, 20 states have removed prevailing wage laws and several more have weakened them. Alabama, Arizona, Colorado, Florida, Georgia, Idaho, Indiana, Iowa, Kansas, Louisiana, Mississippi, New Hampshire, North Carolina, North Dakota, Oklahoma, South Carolina, South Dakota, Utah, Virginia, and West Virginia do not have any prevailing wage laws. Wisconsin no longer applies prevailing wage protections to local public construction projects, but still does for state highway projects. Arkansas and Missouri are currently both debating repeal. 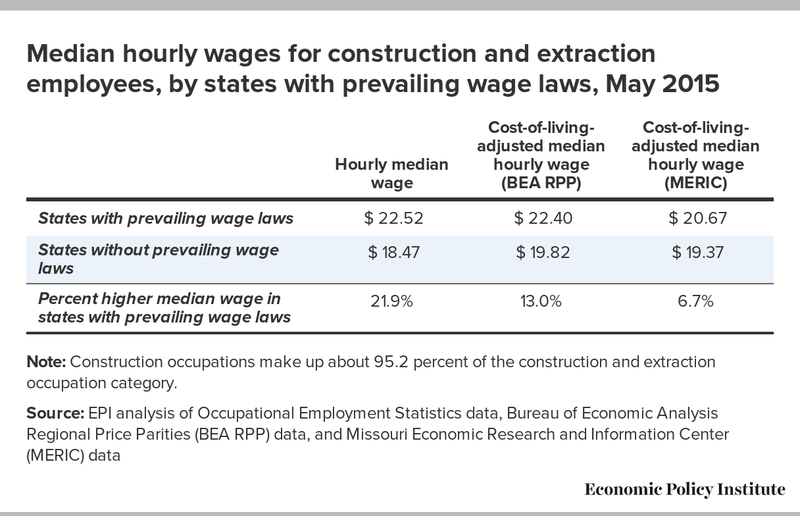 Unsurprisingly, median construction wages are far lower (21.9 percent) in the 20 states that have no prevailing wage law than in the states that still do protect prevailing wages. 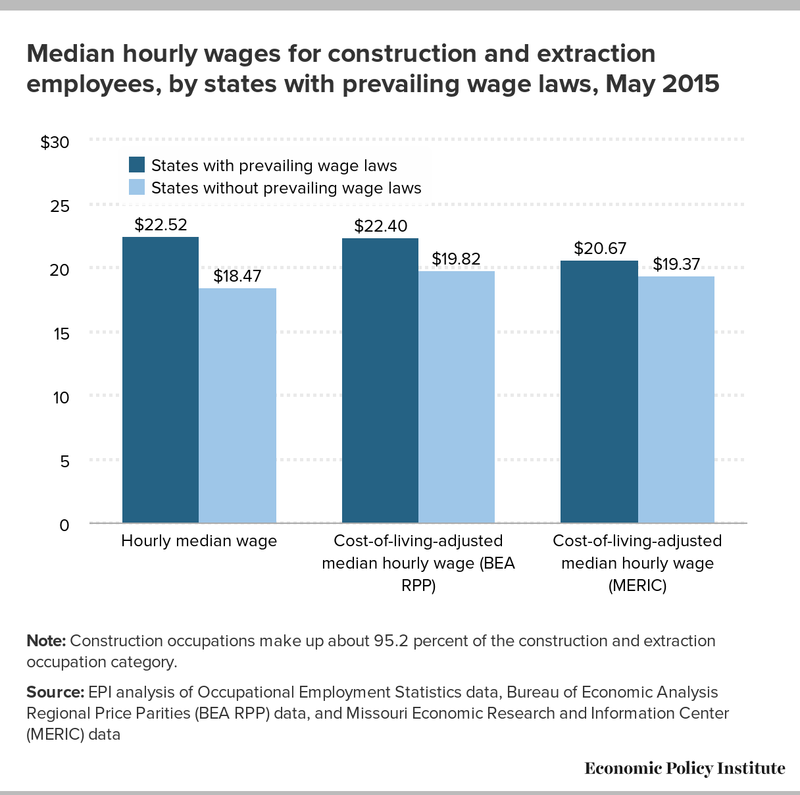 Even after taking into account cost-of-living differences, median wages are almost 7 percent lower in states where there is no prevailing wage law. If state officials want to hit construction workers in the pocketbook, while folding to business interests, repealing prevailing wage laws is an effective way to do it. Note: Construction occupations make up about 95.2 percent of the construction and extraction occupation category.